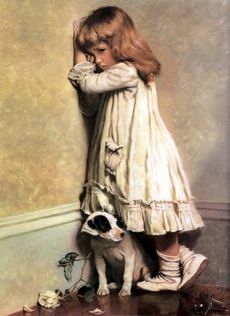 "In Disgrace", oil painting by Charles Burton Barber. 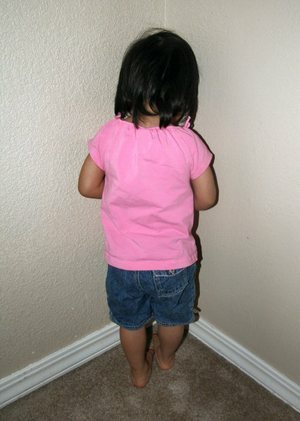 Corner time is a short term isolation punishment that is a form of time-out where the child (or adult, e.g. in roleplay) is made to stand in a corner of the room for a period of time. The corner is sometimes referred to as the time-out corner. The punishment combines the practical side of time-outs (calming down etc.) with a pose and position of shame and thus can be regarded a form of psychological punishment. Corner time is a time-out variant that restricts physical movement tightly and enforces complete inactivity for its duration (whereas grounding or being sent to one's room, for example, permit relatively free movement and manifold activities to enjoy oneself and pass the time). It is therefore a popular technique for teaching discipline. Nose to the wall is a very similar method that is employed where a room offers no suitable corners. A girl puts her doll in corner time. 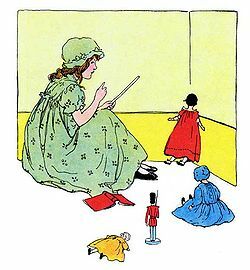 Illustration by Blanche Fisher Wright. There are many variants to corner time. 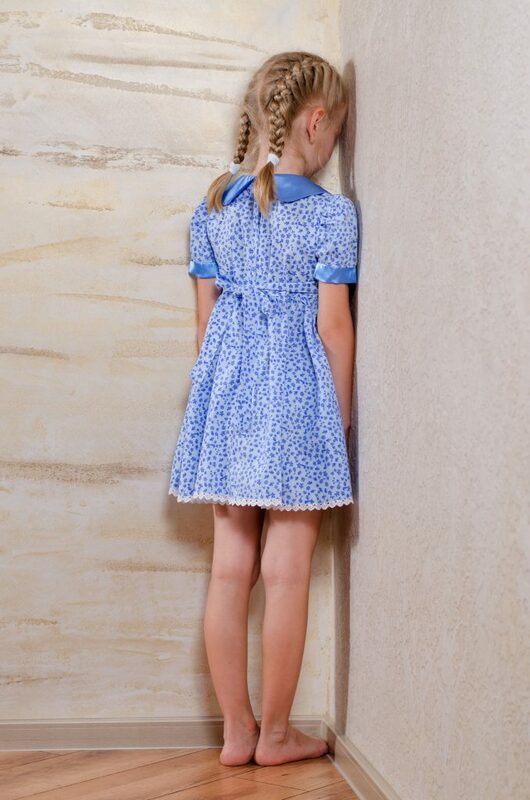 The child can face the room isolating them from participation, however usually the punishment is to face the corner, so he or she is further isolated from even observation the rest of the room. The parent will usually tell the child to go to the corner and stand there still and quiet until he or she is told to go out again. Fidgeting (failure to stand still) during corner time is a frequent cause of extension or escalation of punishment. Pediatrists and developmental psychologists recommend to give for a short time-out approximately one minute per year of age (e.g. 5 minutes for a 5-year-old, 10 minutes for a 10-year-old. That time may be doubled if necessary if the child pushes their limits during the time-out. To keep easy track of the time, a kitchen timer can be set. Corner time is considered the most humiliating form of time-out. Additional instructions (popular in roleplay) can be where to place the hands (e.g. hands on head) and how exactly to stand (e.g. legs shoulder-width apart, one foot from the walls). Corner time can be given before or after a spanking, or both. give the parent time to prepare the spanking (e.g. fetch the implement of choice). extends the punishment and humiliation if the child is made to stand in the corner with their red-spanked bottom on display, and is not allowed for the duration of the time-out to rub their bottom. Corner time can also be given in a break between spankings to give the spanker and/or spankee a rest before administering additional punishment. "In Disgrace", mezzotint after Charles Burton Barber (1887). "A protest." Vintage cartoon from Punch. "Subtle discrimination." Vintage cartoon from Punch. "The Corner Of The Classroom", painting by Edith Scannell (1852–1940). "Corner time", drawing by Lawrence Kinden. A a pre and post spanking corner time. Drawing by Spankart (2002). Aftermath of Truancy. Rendered art by Salalo (2017). Adult woman in corner time after a spanking. Photo by Stan Gere (2000). 2 photographs of a woman standing position in corner time, with a paddle covering her buttocks. Like spanking and other types of punishment, corner time is also popular in domestic discipline and adult roleplay. "Standing in the Corner" A folk song parody by Don A. Landhill that focuses on this practice.